Bay Pride Mall is one of the busiest malls in Ernakulum, Kerala. This mall has lot of branded items and it has place for dining, entertainment and for shopping. Read the below article to know more about this wonderful shopping mall. 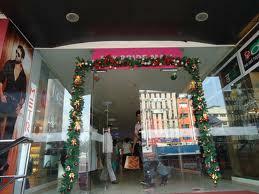 The Bay Pride Mall is located in Ernakulum, Kerala. This mall was established in the year 2006. Both the interior and exterior design of the Bay Pride Mall has attracted the population towards it. In-order to attract more shoppers and visitors and to have a good ambiance, the architect of this mall has built it facing Arabic Sea. The ABAD group of builders, the most famous business group in India has constructed this mall. The Bay Pride Mall is a two storied building of about 21000 square feet. This beautiful Bay Pride mall is stuffed with infinite collections of branded items and hygienic foods with great food courts. Shopping at Bay Pride Mall gives us the pleasure of site seeing and the satisfaction of getting things at reliable price. Populace can get branded items which has lot of discounts and special offers attached with it. You get branded bags, old and latest books of famous authors for all kind of age, Leather products with high quality and at reliable cost and many more. The music store inside this mall has a great collection from Rhymes to classical songs. It does suffice the requirements of all age groups. Women's and teenage girls eagerly visit the ornament and jewels store inside the mall as these stores have good collection of ornaments that can be used daily or for parties and functions. Also, the ornament sections have attractive things for men as well. Everyone can find a solution for their needs in this mall, and this has resulted in superior satisfaction. Apart from shopping, this mall gives a more comfy environment for business communities. Yes, meetings can be arranged over here by advance bookings at low cost. BMS monitoring adds additional secured shopping. The visitors can feel themselves in a secured environment. This mall has many entrance and outlets in first level also. Clean and hygienic washrooms for both men and women are also available here. On an average, more than thousand visitors visit this mall periodically. In order to attract those visitors, this mall conducts many creative shows, cultural programs, shopping festivals and more. It adds to the shopping experience at the Bay pride Mall. Marry Brown: In Marry Brown, you find Burgers, Fried chicken, Chicken poppers and many more. it can definitely attract the chicken lovers. China Town: This part of the food court at Bay Pride Mall invites both vegetarian and non-vegetarian lovers with variety of noodles and delicious juicy items. Other food courts are Potpurri, Third Place, Juice-Lounge etc. A separate section is available at Bay Pride Mall, the Fun and Entertainment section, which is not only meant for kids but their is games for elders as well. Regularly the management of this mall conducts marvelous music shows with most popular celebrities. Also every individual visitor can win a price by showing their unique talents over here. Hence, this mall acts as the best place for exposing their talents while having a good shopping. You do not have to worry about car parking when you go to the Bay Pride Mall. There is both basement parking and open air parking available here. What else to think now? Move on, and enjoy your outing at the Bay Pride Mall. The visitors of this mall includes kids to senior age group. In order to please them, modern kind of elevators and lifts are available inside the mall. Anyone can find their needs over here in a comfy environment. Thousands of visitor in this mall acts as the best proof for customer satisfaction.